FREDERICK, Md. — Actress Ashley Judd learned the truth about her great-great-great-grandfather from George Wunderlich, executive director of the National Museum of Civil War Medicine in Frederick. She thought her ancestor had lost a leg as a Union soldier in the Civil War. The information came to light when the two were working on “Who Do You Think You Are,” an NBC television series that traces the genealogy of celebrities such as Judd. Wunderlich was doing research for the program. He showed her how her ancestor would have been treated and what would have happened to him after surgery. Wunderlich began working with history-related TV programs in 1999. He and a group of people who work with him try to find out the truth about history, mostly from the 1800s. “It’s a bit like a 19th-century myth-buster,” he said. Wunderlich also serves as a commentator, although he rarely sees himself on television because he hasn’t owned a TV for 12 years. He has done 17 shows over the past 2 1/2 years. Among the shows he’s worked on are “The Real Cowboys” and “Battlefield Detectives” for the History Channel, “Who Do You Think You Are” for NBC, “The History Detectives” for PBS and a tourism program for the BBC. “I consider myself an historical windbag,” he said. It started with his interest in banjos. Then he became interested in ballistics and medical history. Now he’s delving into more general history. His main area of expertise is from the 1830s to the 1890s. When he provides commentary he might be on the air two or three minutes for one show, much longer for another. He finds being on TV is good for the museum. 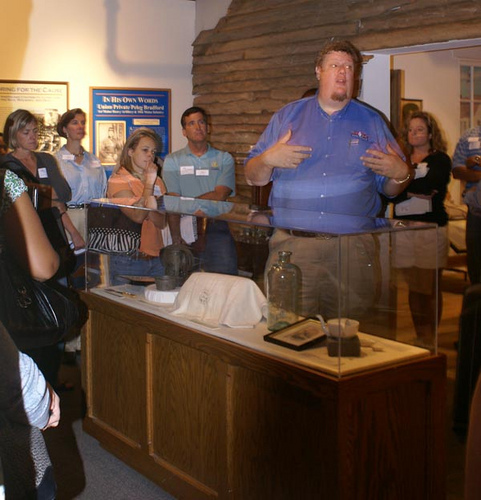 George Wunderlich speaks to a class at the National Museum of Civil War Medicine in Frederick, Md. The exposure has also given him a public face, which has led to lecture engagements at universities throughout the country. Many of the programs in which he is involved are filmed in Frederick County. “If you saw the show and you see me at a gun range, the chances are very good it was the Frederick city police gun range,” he said. And Judd isn’t the only celebrity he’s worked with. He did another “Who Do You Think You Are” episode with Brooke Shields about her Civil War ancestor. Unfortunately, his part never aired. They found out she was related to King Louis XIV of France and aired that instead. Wunderlich had his first TV exposure in 1999, one year before he became the National Museum of Civil War Medicine’s director of education and three years before he became its executive director. He was invited to appear on PBS’ “The Woodwright’s Shop” with host Roy Underhill because he had been making banjos — mostly in the style of the 19th century — since 1992. From there he appeared on “History Detectives.” Soon, other offers started coming in. He works with a research group from the museum — including his top researcher, Terry Reimer, director of research for the museum. The group will examine the smallest details. They once did a ballistic test on a ham to help determine if a cowboy was shot with a soft-tipped arrow or a rifle. His favorite show was “The Real Lonesome Dove,” on the History Channel. He spent many days in New Mexico following the exploits of Charles Goodnight and Oliver Loving, friends and cattle ranchers of the American West. He researched the type of coffin used when Goodnight brought Loving’s body back to Texas. He still plays the banjo and put on a conference about the history of the banjo. But now he’s developed more interests. Categories: Medicine, Museums Tags: 19th Century, American West, Andersonville, Ashley Judd, ballistics, banjo, Battlefield Detectives, BBC, Brooke Shields, Charles Goodnight, Civil War, France, Frederick, genealogy, George Wunderlich, Georgia, History Detectives, King Louis XIV, Maryland, Medicine, Mythbusters, National Museum of Civil War Medicine, NBC, New Mexico, Oliver Loving, PBS, Roy Underhill, Saltville, surgery, television, Terry Reimer, Texas, The Real Cowboys, The Real Lonesome Dove, The Woodwright's Shop, Union, Virginia, Who Do You Think You Are?